Horses, specifically racing 7 white horses with rising sun have a high significance in Vastu. Horses in Vastu denote, success and power. Business and office luck is most important as this will directly affect your wealth and financial position. Feng shui recommend hanging horse paintings in the living room to activate wealth and good luck energy into your home. Feng Shui horse painting is the Feng Shui element of fire and is full of the Yang energy which intensifies good fortune and brings recognition luck, fame, and respect. It is also advisable to select happy galloping horses and not angry emotions expressed in the horse painting. Also take care to avoid hanging abstract broken images of horses in the painting as this creates a distorted image to your mind and may confuse chi energy to enter into your home. 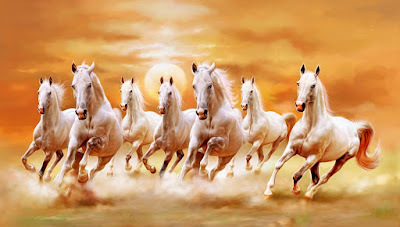 horses galloping painting as feng shui cure to attract wealth and good luck. The direction of the galloping horses is very important and this must always be facing inside the direction of your home, that is the horses coming towards your home and not away from your home.